Target of this project was the exploration of the subjective perception of risk of adolescents. Adolescents were involved actively into the scientific process. Research of risk perception of adolescents has been affected by using qualitative and quantitative methods. High value was set on differences between young women and men concerning risk perception. Additionally, researchers analysed deviations between subjectively perceived and objectively evaluated risks. To explore interactions of sciences, media and risk perception of adolescents it was necessary to invlove adolescents actively. 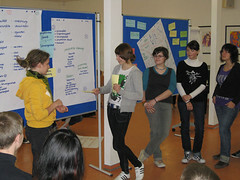 Within this so-called research-education-cooperation pupils of the secondary school ‚Gymnasium Schlierbach‘ together with researchers of the Institute für Pharmaeconomic Research, the Institute of Ecology as well as the Institute for Social Ecology investigated risk perception of adolescents and therefore fundamentally contributed within an area characterised by immense need for future research. Teachers and pupils have been made familiar with methods, which can be integrated in everyday life at school on the long run. Working together with researchers on a joint research project pupils considered as ‚interesting‘ and ‚exciting‘. They attached importance to an intensive and continuous process of communication with researchers. For teachers this kind of cooperation was an enrichment of their professional routine. They expected impulses for the whole regular schooling and considered that this project served as a chance to familiarise pupils with scientific methods. The scientific team members expected new insights concerning risk perception of adolescents with the main focus on risk and sustainability research. It was important to generate results, which would not have been accessible without integration of adolescents. Accompanying, the project was evaluated by the Institute for the Development of Education and School. The results have been played back to the project partners and validated communicatively. Furthermore, the results were embedded in the configuration of long term co-operations between schools and researchers on the one hand, and in the integration of the research-education-cooperation into the mission statement of ‚Gymnasium Schlierbach‘ on the other hand. This research-education-cooperation was popularised beyond national boundaries, as the partner school of ‚Gymnasium Schlierbach‘, the secondary school ‚Friedrich Schiller Gymnasium‘ in Bleicherode, Germany, was partly integrated into the project.